Why is System Shock a Big Deal? "So Shamus, what do you think of / have you heard about the new System Shock Enhanced Edition? ", was a question everyone kept asking me last week. 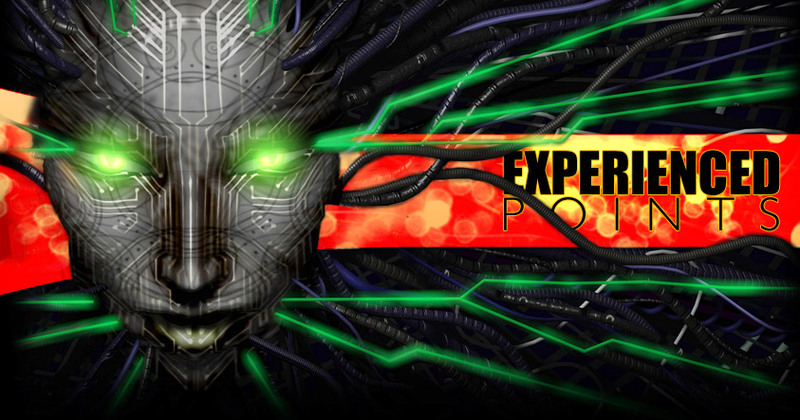 But rather than talk about the Enhanced Edition specifically, let's talk about why System Shock is a daring, celebrated, and influential game that absolutely deserves a place in gaming history, while at the same time it's also a frustrating mess that doesn't hold up at all. Some classics are timeless (Super Mario and Doom) and are still fun to play decades later, while other classics (System Shock, Dune II, the first SimCity) are historic novelties best remembered at a distance. System Shock is the latter sort of classic. It's not that it was bad for its day. It's that nearly everything it does has been done better by one of its many progeny. But before we talk about what's wrong with it, let's talk about why it's a big deal. There are three major franchises that can be counted as descendants of System Shock. (Most of them actually descended from System Shock 2, which is a better game in everything aside from story.) System Shock was created by the long-gone studio Looking Glass Games and was a collaboration between Doug Church and Warren Spector. Church went on to make the Thief series, and Spector went on to create Deus Ex, and you can see bits of the System Shock DNA in both titles. Ken Levine joined the series for System Shock 2, and famously went on to make BioShock, the game most deliberately attempting to recapture the System Shock feel. I've always hated the term "thinking man's shooter", which was popular around the turn of the century and used to describe games like System Shock where you had inventory, skills, puzzles, dialog, or other non-shooting things. The term had the stench of elitism about it, like the people who play "regular shooters" don't like thinking. But ignoring that, System Shock really is the original "Thinking Person's Shooter". (Some people would argue that title should more rightfully go to Marathon. That's probably a flamewar waiting to happen, so I won't debate the point.) 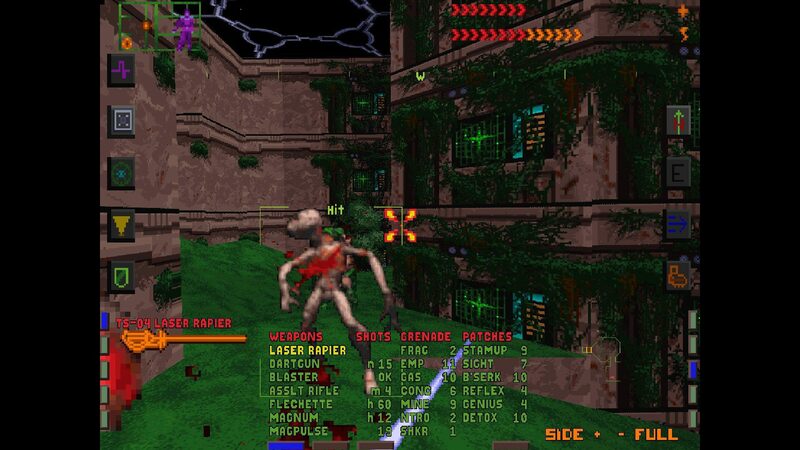 While Doom, Wolfenstein, and Rise of the Triad were happy to hand the player a huge pile of ridiculous weapons and set them loose in a maze of bad guys, System Shock (and later Deus Ex and BioShock) were much more concerned with things like context, story, tone, themes, and mechanics with emergent properties. I can't say for sure that System Shock is the first game to use audio logs, but it's the earliest example of them I'm aware of. (And since CD-based games were very new, there isn't a lot of room for other games that might claim the title of "first games to rely on audiologs". Even lo-fi audio can rapidly outstrip the store capacity of floppy disks.) I think audio logs have something of a bad reputation as a lazy storytelling device here in 2015, but in 1994 they were a smart and effective way to put a story into a game when we lacked the basic tools needed for dialog and personal interaction. The System Shock developers built the game around the things that computers could do well in 1994. It focused on open exploration, scavenging for resources, basic shooting mechanics, and passive storytelling. What it gave us was a sort of mashup of cyberpunk shooter, survival horror, metroidvania, and RPG mechanics. 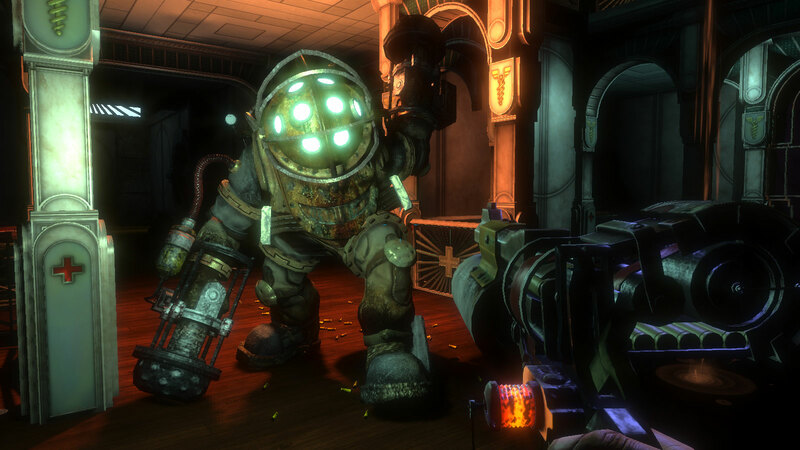 BioShock is often thought of as the most direct successor to the System Shock legacy. It's steampunk instead of cyberpunk, underwater instead of outer space, set in the past instead of the future, but a lot of the core ideas are still there. (At least until the third game, which - for good or for ill - is one of the most un-System Shock games ever made.) Having said that, I never really connected with BioShock. It dumped all of my favorite aspects of System Shock like open exploration, inventory, and resource scavenging, and instead made the story a more central focus. That's fine, inasmuch as that brings the game into the modern age and makes a game the general public would actually buy, but it does leave me still wishing for that System Shock "feel". System Shock also had a pretty strong villain in an era when games had a lot of trouble making interesting villains. Long before The Matrix made cyberpunk mainstream, long before Portal made crazy AI a running gag, and long before Deus Ex asked how much power we should entrust to an AI, System Shock gave us Shodan: A cunning, megalomaniacal, omnipresent AI to oppose the player. Each new zone of the game reveals some new horrible thing she'd done, constantly raising the stakes until the player is able to confront her at the end. As a boss fight she was nothing special, but as a character and a foil for the player she was spectacular.